1. Adjust any left-hand information and confirm if customer is a returning customer or wants to be registered in the system. If yes, change customer from ‘walk-in customer’ via Change Customer. 2. Scan item barcodes, or manually enter item SKU/barcodes for each item. 3. Once all items have been added to the order, Checkout or go to the Payments History tab and accept tender from customer until the Balance Due is $0.00. Multiple forms of tender is acceptable, and cash can be tendered in amounts higher than balance due. 4. Checkout will turn green and become Place New Order when balance due is $0.00. 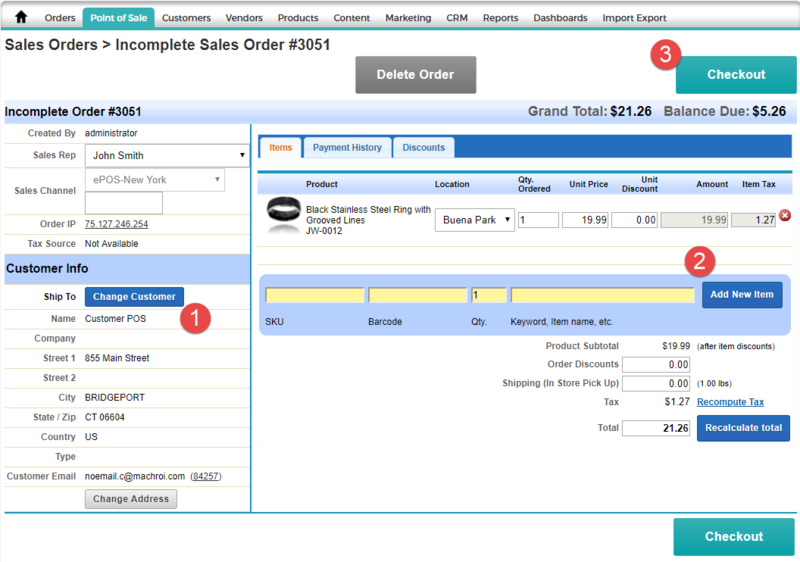 Place New Order to complete the ePOS order. 5. Customer Receipt and one Signature Receipt per credit card payment will print. 6. Cash register will open based on signal from receipt printer. Screen will show change due to customer. Either Logout, or select Done to stay logged in.